This article provides a high-level overview of ways to transfer your data to Cloud Storage, helps you choose the method that's best for you, and covers best practices for digital network transfers using the gsutil tool. When you migrate an existing business operation to Google Cloud Platform (GCP), it's often necessary to transfer large amounts of data to Cloud Storage. Cloud Storage is a highly-available and durable object store service with no limitations on the number of files stored in a bucket, however each file has a maximum size limit of 5 TB. Cloud Storage is optimized to work with other GCP services such as BigQuery and Cloud Dataflow, making it easy for you to perform cloud-based data engineering and analysis with a broader GCP architecture. Where is your data located? For example, is it in a data center or does it reside with another cloud provider? How much network bandwidth is available from the data location? Do you need to transfer your data once, or periodically? Today, when you move data to Cloud Storage, there are no ingress traffic charges. The gsutil tool and the Storage Transfer Service are both offered at no charge. See the GCP network pricing page for the most up-to-date pricing details. After your data is transferred, you pay for Cloud Storage usage based on storage, network, and operations. You should also consider the cost implications for different storage classes and choose the right storage class for your use case. The Cloud Storage API interface is class-agnostic, allowing the same API access to all storage classes. Refer to Cloud Storage Pricing for details. Pricing for Transfer Appliance includes usage fee, shipping costs, and possibly late fees. Ingestion from the appliance to Cloud Storage is offered at no charge. After the data is transferred by using Transfer Appliance, you pay normal Cloud Storage usage rates. Refer to the pricing policy for Transfer Appliance for details. Egress and operation charges by the source provider. Third-party service charges for online or offline transfers. The following diagram shows each of the methods for transferring data into Cloud Storage. The x-axis represents how accessible or "close" the data source is to GCP. In this context, a source with an outstanding internet connection is a small distance away, while a source with no internet connection is distant. The Y-axis represents the amount of data to be transferred. The following diagram helps you navigate the rest of this article and guides your tool selection process. There is no concrete definition for how "close" your data is to GCP. Ultimately, this is determined by data size, network bandwidth, and the nature of the use case. 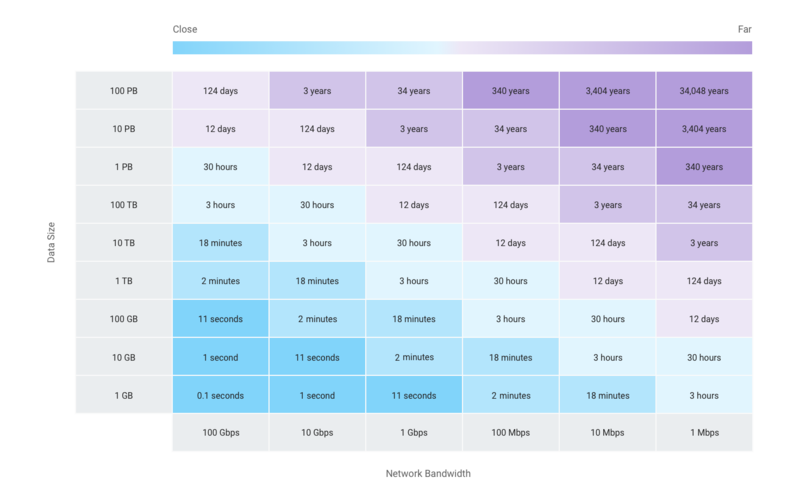 The following diagram helps you estimate data transfer time, given the size of the data and your network bandwidth. Always analyze transfer time in the context of a particular use case. It might be unacceptable to transfer one TB of data over the span of three hours in one workflow, but in another workflow it might be acceptable to transfer the same amount of data over 30 hours. This section discusses ways to improve "closeness", by using the two main levers: data size and network bandwidth. You can reduce the size of your data by deduping and compressing it at the source. Compressing and deduping your data minimizes the amount you need to transfer over the network, both reducing how long the transfer takes and how much the storage costs. If your data includes many small files, compressing and grouping them together with a tool such as tar -cvzf leads to significantly faster transfers when using gsutil or Storage Transfer Service. Compressing data comes with a tradeoff: compression can be CPU- and time-intensive. If you're storing files for archival purposes, consider compressing the files before transferring them to Cloud Storage. If you plan to use transferred files in an app, you might decompress the data in Cloud Storage. In that case, you should transfer the files uncompressed. As a general guide, compressing text data can result in a 4:1 compression ratio. Lossy compression algorithms for binary and multimedia data, such as JPEG or MP3, are often the best option for reducing their size. Favor compact file formats where possible, for example, Avro files are inherently compact. When you use a public internet connection, network throughput is unpredictable, because you're limited by the Internet Service Provider's (ISP) capacity and routing. The ISP might offer a limited Service Level Agreement (SLA), or none at all. On the other hand, these connections have relatively low costs. You can use Direct Peering to access the Google network, minimizing network hops. By using this option, you can exchange internet traffic between your network and Google's edge points of presence (PoPs). Doing so reduces the number of hops between your network and Google's network. Cloud Interconnect offers a direct GCP connection through one of the Cloud Interconnect service providers. This service provides more consistent throughput for large data transfers, and typically includes an SLA for network availability and performance. Contact a service provider directly to learn more. If your data source is an Amazon S3 bucket, an HTTP/HTTPS location, or a Cloud Storage bucket, you can use Storage Transfer Service to transfer your data. If you operate from a colocation facility or an on-premises data center which is relatively "close" to GCP, transfer your data using gsutil or a third-party tool. The gsutil tool is an open-source command-line utility available for Windows, Linux, and Mac. Multi-threaded/processed: Useful when transferring large number of files. Parallel composite uploads: Splits large files, transfers chunks in parallel, and composes at destination. Retry: Applies to transient network failures and HTTP/429 and 5xx error codes. Resumability: Resumes the transfer after an error. The gsutil tool has no built-in support for network throttling. You must pair it with a tool such as Trickle to control traffic at the network layer. If you have privileges at the operating system level and are confident with low-level fine tuning, you could improve transfer time by tuning TCP parameters and/or increasing transfer throughput rate. The gsutil tool is great for one-time transfers or manually initiated transfers. If you need to establish an ongoing data transfer pipeline, you will have to run gsutil as a cron job or use other workflow management tools such as Airflow to orchestrate the work. The gsutil tool encrypts traffic in transit using transport-layer encryption (HTTPS). Cloud Storage stores data in encrypted form, and lets you use your own encryption keys. For detailed security recommendations, refer to security and privacy considerations. When you use a single-threaded gsutil process to transfer multiple files over a network, the transfer might not use all the available bandwidth. The following diagram shows a single-threaded transfer of four files. Each file must wait for the previous file transfer to complete, wasting unused bandwidth. You can use more available bandwidth and speed up the data transfer by copying files in parallel. The following diagram illustrates a multi-threaded transfer of four files. By default, the gsutil tool transfers multiple files using a single thread. To enable a multi-threaded copy, use the -m flag when executing the cp command. The following command copies all files from a source directory into a Cloud Storage bucket. Replace [SOURCE_DIRECTORY] with your directory, and [BUCKET_NAME] with your Cloud Storage bucket name. If you plan to upload large files, gsutil offers parallel composite uploads. This feature splits each file into several smaller components, and uploads the components in parallel. The following diagrams show the difference between uploading one large file and uploading the same file using the parallel composite method. For details about the benefits and tradeoffs to using parallel composite uploads, visit the cp command documentation. You can improve TCP transfer performance by tuning the following TCP parameters. Before you change these settings, read your operating system's documentation and consult an expert. This setting allows the TCP window size to surpass 16 bits by using a scaling factor. The setting potentially allows data transfers to use more of the available bandwidth. Both the sender and receiver must support TCP window scaling for this to work. This setting lets the accurate measurement of the round trip time aid in smoother TCP performance. This setting indicates that the sender can only re-transmit data that is missing from the receiver. These settings determine how much data you can send or receive before sending an acknowledgement to the other party. You can try increasing these settings if you believe they are limiting your bandwidth utilization. By increasing your effective network bandwidth, you can potentially increase your data transfer throughput rate. You can test network latency by running the following gsutil performance diagnostic tool command. Replace [BUCKET_NAME] with the name of your Cloud Storage bucket. You can use gsutil to experiment with different combinations of operating system processes, threads, and more. The gsutil tool lets you better understand the optimal configuration options for your network and determine, for example, whether you should transfer many small files or a few large ones. You can use the following options to help define your network throughput. The -c option sets the number of processes. The -k option sets the number of threads per process. The -n option sets the number of objects. The -s option sets the size of each object. The -t wthru_file option reads files from the local disk to gauge the local disk's read performance. For example, the following command uploads 100 files that are 10 MB each, using 2 processes and 10 threads. The command includes the -m option for multi-threading and the -p option for parallel composite uploads. Replace [BUCKET_NAME] with the name of your Cloud Storage bucket. The following shows sample diagnostic output, including a write throughput value in Mbit per second. Copied 100 10 MiB file(s) for a total transfer size of 1000 MiB. Look for AS15169, the AS number for most Google services, including GCP. The following sample output shows that it takes 6 hops to enter Google's network. For a full list of performance diagnostic tool options, refer to the gsutil tool documentation. The gsutil tool is suitable for many workflows. For advanced network-level optimization or ongoing data transfer workflows, however, you might want to use more advanced tools. For information about more advanced tools, visit Google partners. Aspera On Demand for Google is based on Aspera's patented protocol and suitable for large-scale workflows. It is available on demand as a subscription license model. Bitspeed offers optimized file transfer protocol suitable for transferring large files or large number of files. These solutions are available as physical and virtual appliances, which you can plug into existing networks and file systems. Cloud FastPath by Tervela can be used to build a managed data stream into and out of GCP. Refer to Using Cloud FastPath to create data streams for details. Komprise can be used to analyze data across on-premises storage to identify cold data and move it to Cloud Storage. Refer to Using Komprise to archive cold data to Cloud Storage for details. Signiant offers Media Shuttle as a Software as a Server (SaaS) solution to transfer any file to/from anywhere. Signiant also offers Flight as an autoscaling utility based on a highly-optimized protocol, and Manager+Agents as an automation tool for large-scale transfers across geographically dispersed locations. When your data isn't considered "close" to GCP, offline data transfer is the way to go. 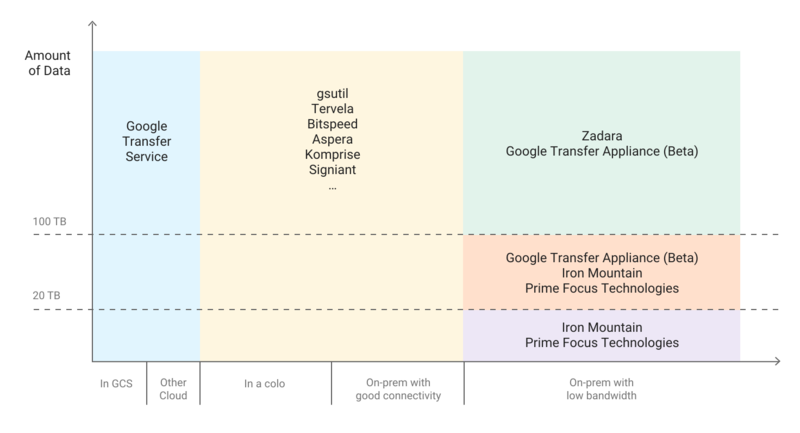 With offline transfer, you load your data on physical storage media and ship it to an ingestion point with good network connectivity to GCP, and then upload it from there. Transfer Appliance, as well as a number of third-party service providers, offers various transfer options that you can vet against your requirements and select from. There are two major selection criteria. Dynamic nature of the data. Transfer Appliance is suitable for large data transfers. However, if you have large amounts of dynamic data, Zadara Storage might be a better option. Contact your Google representative for assistance in selecting the best option. Refer to this guide for migrating HDFS data from on-premises to GCP.